Bangor Coffee News pitcher Jesse Colford throws a pitch against Pastime during their American Legion baseball state tournament game last season in Augusta. On Sunday, Colford led Bangor by Yankee Ford, 9-4, to win the American Legion baseball state title at Husson University in Bangor. BANGOR, Maine — There was a point this spring when there was no certainty that Bangor’s Coffee News Comrades would even field an American Legion baseball team this summer. Coach Dave Morris had commitments from just five players as the high school regular season neared its end, but some late recruiting and the addition of players from the defunct Motor City team left the Comrades with a full roster to begin Legion play less than 24 hours after Bangor High School won its fourth consecutive Class A state title in June. Now that patched-together Queen City Legion contingent is itself a state champion again. Tournament most valuable player Jesse Colford scattered 11 hits and struck out 13 batters over 7 2/3 innings at Husson University on Sunday and the Coffee News bats broke loose for 12 hits as the Comrades defeated Yankee Ford of South Portland 9-4 to capture the program’s third state crown in four years. Bangor’s high school and Legion teams have now appeared in eight consecutive state finals, compiling a 7-1 record in those contests. “I knew we were going to be good, maybe not as good as last year but we’ve come out and proven ourselves and proven everybody else wrong that we’ve got what it takes to win state championships,” said Comrades’ catcher Tyler Parke, who reached base five times and scored four runs as Coffee News avenged a 5-4 loss to Yankee Ford in the 2016 championship game. Zone 1 champion Bangor Coffee News (18-6) advances to the Northeast regional tournament in Shrewsbury, Massachusetts, and will play Vermont in its opening game at 9:30 a.m. Wednesday. Yankee Ford, the Zone 3 champion, concluded its summer at 18-8. Colford, a right-hander who pitched as a freshman at Husson this spring, made the most of his second start in the state tournament. He had been strategically pulled from Coffee News’ first game last Wednesday after striking out 15 batters over 6 2/3 innings during a 73-pitch performance that enabled him to return to the mound on three days rest according to the first-year American Legion pitch-count rule. 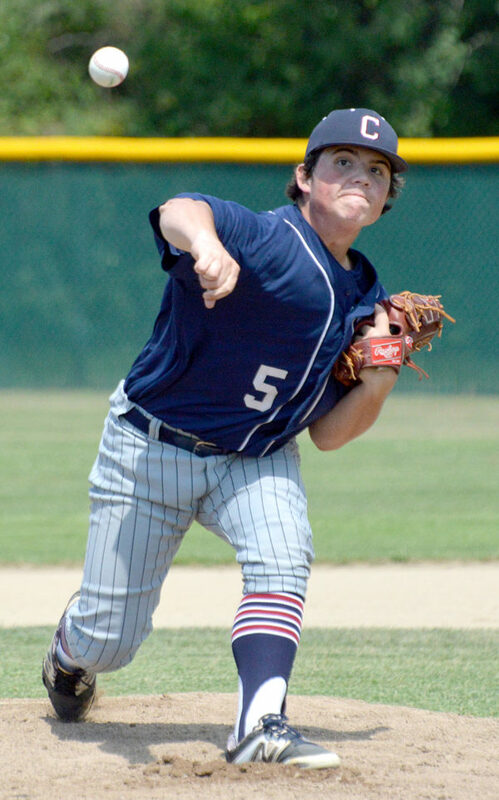 Colford held Yankee Ford scoreless as the Comrades built a 4-0 lead through four innings, and even as he yielded two runs in the fifth and a third run in the sixth he enabled Bangor Coffee News to continue to play from the lead. Colford struck out the last two batters he faced before leaving the game in the bottom of the eighth, with Zach Cowperthwaite coming on to finish off the victory on the mound. Nate Ingalls tripled, doubled and singled for Yankee Ford, while Ben Conti, Riley Hasson and Alex Livingston each singled twice. The Coffee News offense pecked away at a depleted Yankee Ford pitching staff that had to work one additional game in the tournament after the South Portland team fell to the Comrades 2-0 in a winner’s bracket game Friday night. Bangor scored at least one run in six of the first seven innings to build a 9-3 lead, aided throughout the contest by eight walks and seven hit batsmen issued by Yankee Ford pitching. Ethan Stoddard stroked a two-run single in the fifth inning to give the Comrades a 6-0 lead, then added the game’s exclamation point two innings later by blasting a first-pitch fastball over the left-field fence for a two-run homer that made it 9-3. “A lot of teams win a state championship and are satisfied, but this team will regroup after one day and go down to the regional and compete and let the chips fall where they may,” said Morris. “That’s kind of how these teams have rolled over these last few years.